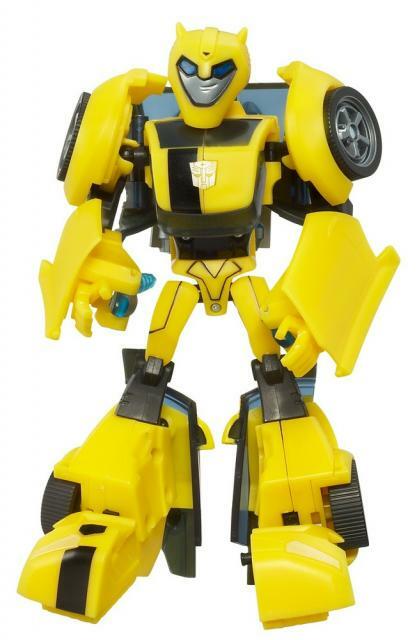 Hasbrotoyshop.com sent out their latest mail catalog this week, and wave one of Animated was listed as available for order! Deluxes Cybertron Mode Optimus Prime, Bumblebee, Lockdown and Prowl will be $9.99 and Voyagers Starscream and Cybertron Mode Megatron will be $19.99. Representatives on their toll-free line tell fans these highly in-demand toys will be live on their website on March 25, just a week from today! HTS is currently updating their system, as discussed here. As a result most people order histories have been mostly cleared out (temporarily). Give it a couple of days then check back. As for the shipping dates "DON'T YOU BELIEVE IT!!!" Hasbro page got updated. i deleted my old orders and listed my preorders as "backordered" instead of "backorder" also bumped the ship date for all including the leaders Megatron and Bulkhead to today the 18th, which is great but i have a feeling that they maybe keep changing the day everyday till it ships. That would be nice but with the different discount codes they put out it would be a little hard to do. Surely they wouldn't let you apply a discount code for an item listed after the expiration date. As of now I have 5 pre-orders that include all the Animated Deluxe, Voyager, Leader, and the boxed set plus the Universe Deluxe, Voyager, and Ultra figures. That's 23 figures right there (counting the Deluxe size Prime and Megatron form the box set separately and not counting Minicons). I didn't realize I had so many pre-ordered figures and there are a lot more to come before the end of the year. Animated Roll Out Command Optimus Prime Supreme up for preorder at HTS. Just preordered, 49.99, total was 54 with tax and shipping minus 10% code. Says shipping end of august. They had some nice clear pics of alt mode, robot mode and box up for it too. I wasn't quite sure about him either. I love the axe, I would like to see how poseable he is and I know he wouldn't fit in with the rest. I also hate to have so many Primes for one line on the shelf. I will probably end up cancelling him because he drives my HTS preorder bill over 300 bucks and thats too much for me in a time span of a couple months. agreed this line is really getting pricey. i'm usually a couple of figures a month kinda guy but come end of june i'm going to have an avalanche of figures coming in. really does some damage to the ole bank account. unless they put up and another great code like the 20% off plus free shipping i'm going to wait until this stuff comes one Amazon because 10 bucks saved is a deluxe figure. that said i did preorder the Leader Bulkhead and Megs and Voyagers Lugnut and Grimlock just in case. will cancel if i find on Amazon in August. whats weirder is that it seems to be the only one. I actually called HTS. I asked the rep since some of the new listed dates are May 26th yet my preorders still say 06/23 will my preorder ship first before these new ones as soon as they get in stock or will their computers screw up and mail those new ones first. Her first answer was "I donutknow…" I then kindly asked if she could ask someone above her to get an actual answer to my question. After 5 minutes came back and said talked to supervisor who said they will ship preorders first as stock comes up. Looks like their systems just don't update already done orders with new information. Probably why you have to cancel complete orders instead of single items or create a whole new order to add items. (checks) … Interesting, and yet all my pre-orders still list 6/23 as the expected ship date. I hope they don't get held back for that when the toy is available in May. Tempted to pre-order the newer goodies, but I think I'll wait a bit. Not like they're going anywhere. agree, i preordered the new ones just as a back up encase they get put on sale to amazon too late. Thank you for contacting us. In response to your inquiry, the items that you ordered are currently not available but en route to our fulfillment center. We expect to be able to ship it by the date indicated below. We apologize for any inconvenience this may have caused. If you would like to wait, you need do nothing. However, if you would like to cancel your order, please contact our Customer Service Center at the phone number below. Your credit card will not be charged for backordered items until they have been shipped. Backorder – Due 06-23-08 Unless our shipment comes in sooner. the Shift-tech game has been added to the animated page! ok, not that exciting but still note worthy. A note to anyone ordering. Some of these dates still seem to be in flux. Yesterday, grimlock & lugnut said 7/10. This morning, their entries say 8/28. Wv1 voyagers are 6/23 except starscream which is 5/26. Hmm…Grimlock and Lugnut are different. Bulkhead was sold out yesterday so we didn't have a date and cybertron Megatron said 6/23 yesterday, wasn't 5/26. Only Starscream and the wave 1 deluxes said 5/26 yesterday. Maybe they are selling out in batches and pushing back the time? My Wave 1's still say 5/26 and my Grim and Lug say 6/23 on my order tracking. It means that people who snooze are gonna have to wait. This is better then them simply 'selling out'. They are accepting demand and simply delaying shipping. Wow! Looks like HTS has moved up the street date on some of these items. Shipping about 5/26. I may have to place an order now.